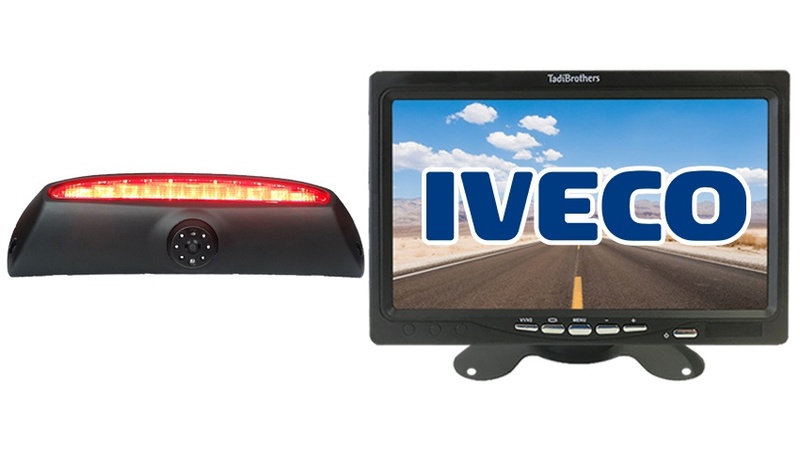 When comparing the 7 inch rear view monitor in this system to that of even the monitors that come stock in your van, our screen always beat the competition, we have been asked by many companies who bought backup systems directly for the car manufacturer to later come in and install our system for numerous reason beyond our superior quality. For example on TadiBrothers allows you to watch the camera while in reverse and for those that want it only when you back up, you can choose how you want the camera to turn on, so the decision can be made once you get and try different options. Also our monitors are the best when it comes to compatibility with night vision lenses. The best back up cameras for vans have been sold by us since 2003 and we are proud of our service record. The Iveco Daily Van Backup Camera has a 120° Degree viewable angle, its waterproof and has auto night vision. The camera is one and has excellent night vision clarity, we are proud to say it is military grade quality. The Iveco Daily backup camera simply replaces your middle brake light. This allows the camera to be hidden in plain sight, it looks completely stock and is a great option for anyone with an Iveco Daily Van. This camera can take a direct hit from a rock and it will still work like new. Its has also been very popular with Iveco Daily Vans, because its housing allows you to install the cameras on multiple sides of your van. This system comes with a 35ft Premium cable which should cover the length of any Iveco Daily van. If you need a longer cable we have many different lengths.